It’s been fascinating to watch the evolution of responses to the recent revelations about NSA surveillance activity. When The Guardian and the Washington Post first published their stories on Friday, the news that the spy agency was collecting vast quantities of data from phone calls, emails, chats and other online behavior sent shock waves through both the tech community and the public at large — but over time, the concern seems to have dissipated. Have we lost our ability to be outraged because we’re so used to the idea that we’re being watched? I confess that the Pew survey didn’t surprise me at all. Within hours of the Guardian and Post stories, there were responses flying through my Twitter stream and on other social platforms that amounted to a collective shrug of the shoulders: We knew this was happening, at least in general terms, most said — so why make such a big deal out of it? After all, the Patriot Act has been around since shortly after September 11 of 2001, and it authorizes a fairly wide variety of surveillance under certain conditions (although even the author of that Act says the NSA’s recent behavior over-reaches what was intended). Another possible cause of the somewhat apathetic response is that so little is known about what the NSA is doing exactly. The initial reports said that the spy agency was provided with “direct access” to the servers of companies like Google (s goog), Facebook (s fb) and Yahoo (s yhoo) and could get whatever data it wanted — but then the qualifications started, and pretty soon it wasn’t clear what exactly “direct access” meant, or what kinds of data the NSA was permitted to get. One thing PRISM makes clear is that all of those tin-foil hat wearing people knew what they were talking about. After some follow-up reporting from the Post, the New York Times and the Guardian, it appeared that the term “direct access” could refer to a system set up by the tech companies in question that would essentially automate official requests under the Foreign Intelligence Surveillance Act, providing a kind of secure area or “lock-box” to which only the NSA would have the keys. In other words, something that amounts to direct access by another name. So one popular response boils down to: “Well, this is all legal and above-board then, so who cares?” — even though others pointed out that the court that approves the FISA orders is secret and has reportedly approved 99.9 percent of all requests made to it (according to other reports, the NSA and others can surveill wide ranges of data for weeks before they even need to get a court order, and other kinds of data such as chats may not even require an order). Don't be distracted. The big story isn't Edward Snowden nor intelligence leaks. It's government's disregard for privacy and civil liberties. Part of the problem could be that, while leaker Edward Snowden’s dramatic revelations have gotten a lot of attention, there have been plenty of previous reports about similar activity over the past decade and very few of those have prompted much outrage at all. Former AT&T employee Mark Klein provided some pretty damning evidence in 2007 about how the NSA had set up a “secret room” filled with equipment that the spy agency could use to duplicate whatever data it wanted (using prisms, coincidentally enough) and that story eventually died. 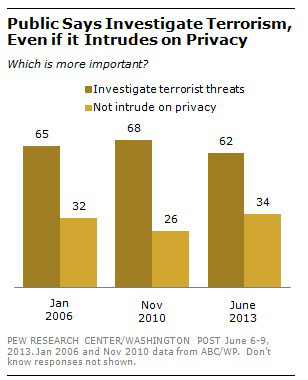 Have views about personal privacy changed so dramatically? And if they have, are Google and Facebook and other “cloud” services part of the problem — or at least part of the reason — for those changes? It’s possible that we’ve become so used to the idea that our online lives are an open book, whether we like it or not, that there’s no longer any point in fighting it. If Google and Facebook are tracking all of our data and metadata in order to serve us ads, what difference does it make whether the National Security Agency is also doing it? David Sirota at Salon makes a persuasive case for why the NSA’s actions aren’t even remotely the same as what Google and Facebook do — primarily because one is at least notionally voluntary. But that may not make a big difference to many users once the heat of the recent headlines has dissipated. The other complicating aspect is that, even if we were to get outraged about the NSA surveillance, it’s not clear what anyone could do about it. As more than one person has pointed out, it’s difficult to have the kind of “open debate” that President Obama said he wants to have about privacy and security when all of the actions of the NSA and PRISM are classified top secret, as are the court orders they use, and the secret court that produces them. Google isn’t even allowed to say that it gets FISA orders, although it is now trying to get approval to at least mention them. There are some efforts aimed at pushing the debate forward, including a project called StopWatching.us, which is backed by a coalition of companies and entities — including the open-source Mozilla project and the Electronic Frontier Foundation. But all it plans to do is send a letter to Congress asking for changes to the Patriot Act and FISA (which some members of Congress are also asking for). There’s no real chance of a “Stop SOPA” type of movement because Google and Yahoo and Facebook are all involved in what is being protested about. And the final death knell for broader interest in such matters is that the news cycle inevitably moves on. The NSA story is complicated, information about it is fragmented and contradictory, and most of the answers are top-secret and therefore unlikely to ever be confirmed. Not a great recipe for something that’s going to hold the attention of the average reader. If they get a warrant, they will turn over the information or go to jail. True. but Nick Oba is looking to do everything he can to resist- even if it means relocating to another country. The only thing this kerfuffle illustrates is that the average American is ready to believe the worst about the government, no matter how dubious the allegation. I can say with absolute certainty that the NSA is not violating the fourth amendment rights of innocent Americans, because it was my job to ensure that they didn’t, along with hundreds of other oversight officers. I can also tell you that it’s not surprising that someone who works inside the enterprise doesn’t understand what it does or how it operates. It’s one of the hazards of compartmentalizing information for security’s sake. Unless you have long experience and fairly broad access, you’re likely to be clueless about what’s actually taking place. That’s by design. Unfortunately, every few years we get a junior person with an ideological axe to grind, and they run off half-cocked screaming about the government’s nefarious doings. I assure you, the enterprise wishes it had the time, talent and resources to even theoretically do half of what it’s accused of doing. If they are getting the information without a warrant, which by all accounts they are, then they are violating the 4th Amendment. Not looking at the information until they get a warrant does not comply with the 4th Amendment, as the government is trying to claim, and as they might have told you. If the conservatives is doing almost anything to fight terrorism, so why do they accept that U.S is selling advanced weapon-system to the feodal-dictature-state Saudi Arabia? It is wellknown that they are financing schools for religious fanatics. What do you think religious fanatics are doing!? I feel I have nothing to hide, so I don’t care. Look at my calls, texts, etc if that tickles your pickle. That’s not how a 4th Amendment analysis works. If you want to waive your 4th Amendment rights you are always free to do so, but you cannot waive them for others. I think a lot of people are upset – but what can they actually do? Write a strongly-worded letter to the local Congressman? Some of this is the Guardian media model in the US. This is not a criticism at all, but they generally “leak” something BIG that everybody already knew at a time when the story and revelations make maximum impact. It seems this strategy will work out quite well for the Guardian in the US. When I email a friend that I just spent a great evening smoking a fine cigar on my deck and instantly all the ads on my various free email and social media accounts are for cigars and cigar-related products, it’s hard not to assume that everything we write online is reviewed by some algorithm. I assume if I start writing about ricin, some machine somewhere would note that, apply some machine logic to determine if I warrant further scrutiny, and proceed from there. It’s the price of admission to a public space, which is what the Internet is. Your advertising example is not government action. The 4th Amendment does not restrict the actions of private companies. The internet is only as public as you make it. Emails have the privacy equivalent of snail mail. My wanderings on the internet have the same privacy as my wanderings in my car. If the government has proof of my wrongdoing let them convince a judge and get a warrant. THEN they can track me. How is this not what American who’s taken a civic class feels? It’s politics. Liberals think Obama walks on water and can do no wrong. Conservatives will do almost anything to fight terrorism. Add in a general lack of understanding of the Bill of Rights (e.g. “I have nothing to hide”), and it’s amazing that 90% of the people are not concerned. I take back my comment about liberals and Obama. The ACLU is suing the administration. I’m a bit shocked since they have become less about protecting the Bill of Rights and more about being a tool of the Democratic party (e.g. suing to stop the recall election of Gov. Davis in California). All these CIA, NSA and DHS things smell like Gestapo all over again. The fact that the public even allows them to operate tells me US is going down the road of Nazi just like Germany did in 1930’s. Looks like every empire ends up that way.